Having just come back from a holiday in Southern Ireland where Celtic Knots were visable in many places from rings to roadsigns I' ve had my fill of knots! 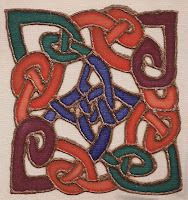 The painting below is on silk and I've often thought I would like to tat the design but a true celtic knot has no beginning and no end, so there is my problem! The Celtic Knot symbol, is also referred to as the mystic knot, or the endless knot. One of the attractions to me is the many colourways that can be seen in some of the designs. The tatted celtic knot design is by Ruth Baker and I've only ever made one (and this is it!) and not sure if it is woven correctly! 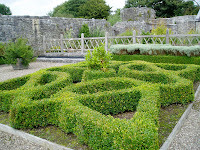 Whilst in Ireland we visited a castle and in the herb garden was this hedge design looking very much like a celtic knot. On the sea voyage returning from Ireland it was my stomach that got into a bit of a knot. The Irish sea was very rough, we were told that it was the tail-end of the American hurricane Bill, thank you to those who live over the pond! The car ferry was the smaller and faster type which makes the journey shorter and it therefore rides the waves, so to speak. It nearly didn't sail because of the weather conditions but before we boarded we were warned that the crossing would be rough. Having put the car on the car deck and left it to go to the passenger area we arrived to find sick bags on all the tables, not a good sign. The ferry started and a steward handed out a small measure of rum (perhaps not as much as a "Tot") to anyone who wanted it! Then about three quarters of an hour later when the sea and the sky were definitely meeting, soda water was handed out in plastic cups. I must say that we were well looked after but I have a feeling that it was in the shipping lines best interests to make sure no one was ill. I am a notorious bad traveller, its one of the things I hate about going anywhere be it in a car, bus, boat or aeroplane. I always take travel sickness tablets and when on a boat just lie down, it doesn't stop me feeling sick but it is crucial that I remain in the horizontal position! My son thought he would help once on a sea journey by telling me to sniff ginger, now every time I smell ginger it just makes me feel sick! Everytime I go to Ireland I take my tatting and of course give some away. There is one particular lady who I visit, now in her eighties, with a very large family who are always in her home helping her. Well she loves to receive a tatted gift. A few years ago I took her a goose and a swan, both Jane's patterns. One of her daughters made them into a picture as you can see. 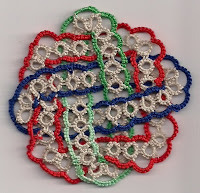 This very much reminds me of Carol Lawecki and how she also incorporates some of her tatting into pictures. Before a few more of you rush to comment that you do the same, I've seen some of them and they look very effective. Just wish I had that talent. This particular picture sits on her large sideboard with all the pictures of her vast family. On the news today here in Britain we were told to encourage bees into our gardens by putting out water flavoured with sugar. The honey bees in the UK need an extra bit of help as 40% of them have been lost in the past four years and the number of species of British bumblebees has halved since the 1950s. The bees have been leaving their hives in droves, resulting in a serious drop in honey production. Apparently this is happening all over the world. We should be alarmed by the bee’s decline – after all, the honeybee account for 80% of all pollination so food production could be seriously damaged. Now I have a friend who loves bees, she talks to them and when they land on her she even strokes them. She is a church flower arranger so obviously is used to the little critters! I tatted some "Itty-Bitty Bumble Bees" from Martha Ess's book "New Critters on the Block" although I've had the book for ages this is the first time that I have ever made anything from it. Mainly because I thought I wouldn't understand the patterns - sorry Martha that's no reflection on your designs just that I'm so used to Jane's! 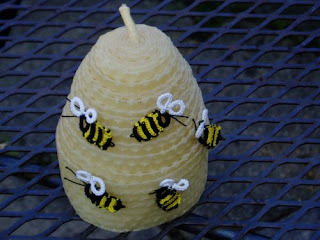 The bumble bees are pinned to a bees wax candle. I then decided to chase the bees around my garden and next doors (who came out to see what I was doing!) and these pictures are the results. 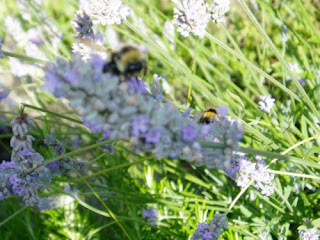 You can just about see a bee in the natursiums and a few on the lavender. 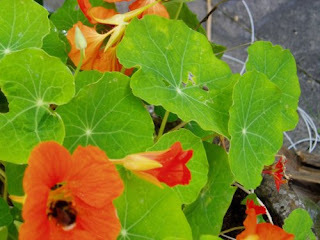 They were extremely difficult to photograph as they were so busy collecting the pollen. There is also a picture of the mascot for the local Air Ambulance, they use a Bee because their call sign is "Alpha-Bravo" ABee! 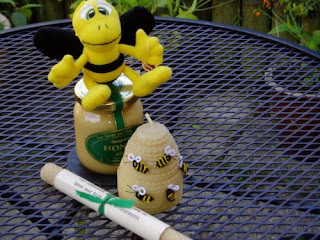 He is sitting on a jar of local honey, there is also another bees wax candle which came from Ireland, the smell of the wax is beautiful, I wish you could smell it! Now I'm not generally a pink sort of person, I prefer browns, blacks and purples, but somehow I seem to have masses of pink thread at the moment. 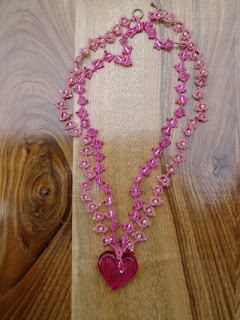 The necklace attached to this pink heart is made with Jane's technique of attaching beads to SR and I found it an easy and effective method, and plan to enclose more beads this way. The phrase "In the Pink" was very common during the early 20th century and even up until the 21st century and generally it means being in the best of health. It has though now almost disappeared from our vocabulary, instead we are more likely to say that we are "feeling in good health, or very well thank you." The phrase apparently originally came out of the English fox hunting tradition where a rider was not granted the right to don the scarlet coloured jackets, called "pinks" (a red colour), until he demonstrated superior horsemanship and service to the hunt. Being “in the pink” meant the rider had reached the pinnacle of achievement or status in the hunt. 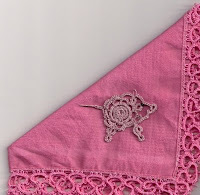 In England, at the moment, there are many people who are not feeling "in the pink" due to the swine flu epidemic and that's why I thought I would show you this little pink pig on a pink handkerchief, to remind everyone that "coughs and sneezes spread diseases catch your germs in a handkerchief" (also a popular 20th rhyme encouraging people not to cough and sneeze everywhere), however now we are advised to use a paper tissue and then bin it!